Which side of the contact lense should face the eye? 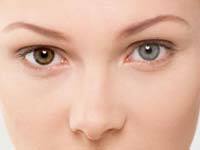 Many people want to know how to put on contact lenses and to know whether they are inside out or inserted properly. This can be confusing for first-time wearers or for people that haven't worn contacts in years and want to return to using them. There is a very simple way to affirm if you're wearing your contacts in the right way, apart from the fact that you will feel the discomfort immediately if its on the wrong way. The trick is to place the lens on your finger so it's forming a cup, and then hold it up directly in front of your eyes so you're looking at the side of the cup. If it's forming a "U" with the top edges flared out, it's inside out; if it's forming just a "U," it's correct.